Anirban Bandyopadhyay is a young man but you wouldn't know that just from looking at his resume. A Senior Scientist in the National Institute for Materials Science in Japan and currently a visiting scholar at MIT, he is an expert in mathematics, physics, molecular biology, quantum mechanics and in a variety of other fields. 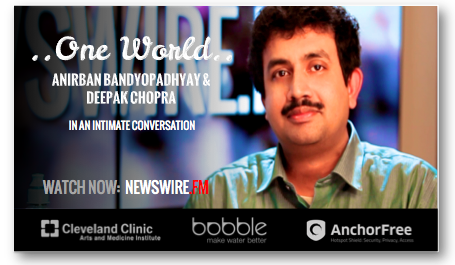 Deepak Chopra recently sat down with Anirban for Newswire.fm's program One World, to discuss his work and his passion for solving the riddles of the human mind. "My target was to understand the human brain," Anirban told Deepak. "And unravel the mystery associated with it by any means. I do not fear to enter into any field." It was a lofty goal, one that required him to become an expert in multiple scientific disciplines. He was undeterred by the scale of the undertaking. "I went on learning whatever I had to learn to unravel this mystery." The result has been an entirely new way to research the brain. Today, Anirban is working on what is known as the chain of resonance; the idea that all matter from the tiniest particle to the universe itself are connected through a series of vibrations. This has serious implications for the way we view all of human life. "Evolution is just a march to capture material or matter from nature and enrich that resonance chain," Anirban explains. When we pass on our DNA to a child, we pass on all of the enrichment that we have gained in that chain and the child continues from where we leave off. When Anirban speaks of his work, his passion is evident and his desire to share his knowledge is clear. There can be no doubt that he will continue to do whatever it takes and make advances in whatever fields necessary to answer the burning questions that he has. His enthusiasm for science and learning have put him at the forefront of his field. He has proven time and time again that just because it hasn't been done, doesn't mean it can't.